Man! Nobody better mess with us - what a bunch of serious guys - off to tackle the world. Now where O' where is everyone now? Do we have a future Prime Minister in our midsts (Yes we do)? Is there a Senator? Are there Doctors, Managers? Engineers and Scientists? I had started a very informal photo club on the steps of the old Grammar School. 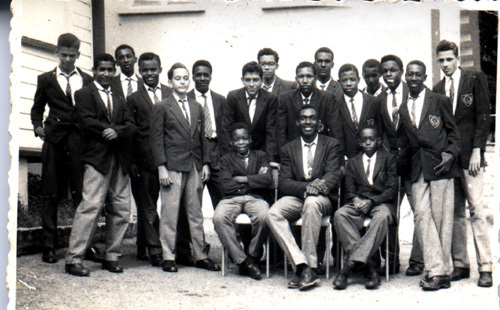 I received an e-mail updating me that Parnell Campbell had a Photo club but with a darkroom and he may be a source of 'old' pictures. 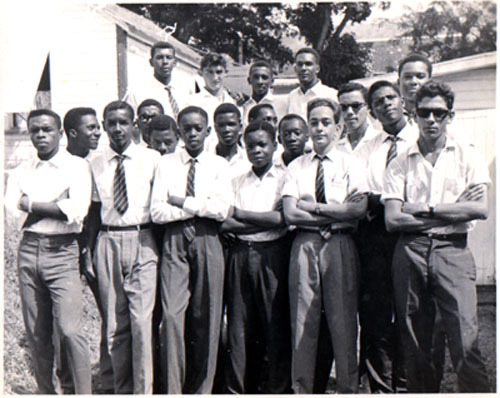 Basilon Cole, Roderick Browne, Cameron James, Anthony Gonsalves. 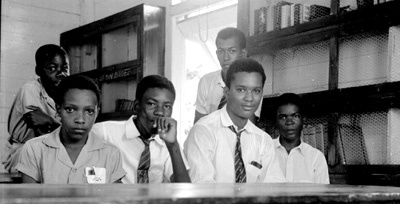 Sitting, L. to R.:David Williams, Ivan Roberts, Lennox Iton. Thanks Lennox for supplying all of the names. Extremely studious - who would have predicted that this photo would end up on the Internet. I have had one inquiry about Renwick Rose.- Does anybody know where he is and does he have e-mail?